Society of Innovators shines the spotlight on the region’s big thinkers. Similar to when atoms collide at high speeds, something remarkable happens when ideas collide at innovative speeds. Now in its 12th year, the Society recognizes and celebrates this spirit of innovation in this seven-county region. Through a project of the Gerald I. Lamkin Innovation and Entrepreneurship Center of Ivy Tech Community College Northwest, more than 1,000 innovative pioneers have been unveiled and heralded. Each nominated candidate is vetted by 19 judges before finalists are determined and winners announced. “These judges know what they’re doing is very important,” Davies says. This year, the Society selected six fellows in addition to team-based trailblazers selected for two awards: the Chanute Prize for Team Innovation and the Accelerating Greatness Award. These heralded recipients were formally inducted into the Society during an Oct. 20 ceremony at the Horseshoe Casino in Hammond. Here is a snapshot of their stories. In 2004, the City of Whiting was dramatically affected by the implementation of the circuit breaker credits, state legislation that ensured property owners do not pay more than a fixed percent of a property’s gross assessed value. This law placed stiff tax caps on municipalities, which devastated the lakeside city through drastic revenue loss, forcing city officials to remake what was once known as only a sleepy company town. Stahura, who’s known as “Mayor Joe” by residents and his talented staff of municipal innovators, transformed Whiting into a destination location, an unheard of description for the city with an oil-refinery reputation. They did so through an innovative use of classic techniques and imaginative visioning, judges stated. These actions led to multi-million dollar investments, including lakefront beautification, a revitalized downtown, and the National Mascot Hall of Fame, a year-round family-friendly attraction. When Sandra Chimon-Peszek Rogers found out she was chosen to be an esteemed new member of the Society, she reacted with the enthusiasm of a young student. 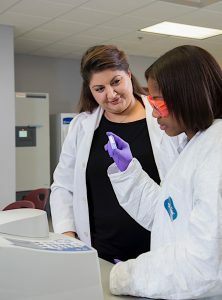 “REAL-LIFE EXPERIENCE” Sandra Chimon-Peszek Rogers, Ph.D., director of the Calumet College of St. Joseph Biophysical Chemistry Department and a researcher into Alzheimer’s disease, works with biomedical major Ciara Carmichael. She is director of the biophysical chemistry department at Calumet College of St. Joseph, and a determined researcher into Alzheimer’s disease. She launched an innovative curriculum combining classroom lectures with hands-on lab work to especially help students who’ve been under-represented in the sciences, including women, minorities and first generation college students. “Through her recruitment of promising women and minority students into the CCSJ Science Program, her innovative and engaging teaching methods and her mentoring, Dr. Rogers has proven that students aspire to careers in the sciences and that they can compete at the highest levels,” says Daniel Lowery, the school’s president. It didn’t take long for Elizabeth Lynn to reflect upon the civic meaning of her award. “KEEP FOCUSED ON THE GOOD YOU ARE SEEKING TO DO” Elizabeth Lynn, Ph.D., founded the Center for Civic Reflection at Valparaiso University. 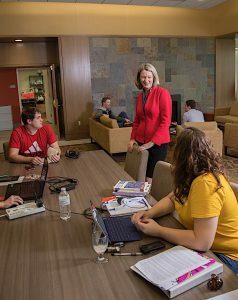 The nationally known center, part of the Institute for Leadership and Service, developed and refined an innovatively applied use of the humanities to illustrate issues of concern through reflective dialogue. Civic reflection uses readings, images and videos to engage people in productive conversation about their communities. To date, the center has trained more than 7,000 facilitators while leading more than 20,000 individuals in public, community and workplace dialogues. Through a new, comprehensive high-tech classroom initiative, involving a five-year $10 million upgrade for technology enhancement district-wide, Barbara Eason-Watkins highlighted a transformation achieved through fresh ideas, improved curricula, and community-influenced collaboration. She has demonstrated an innovative spirit of collaboration involving many initiatives, including the first NIPSCO Energy Academy, the first STEM public elementary school, and the first construction technology program, judges stated. 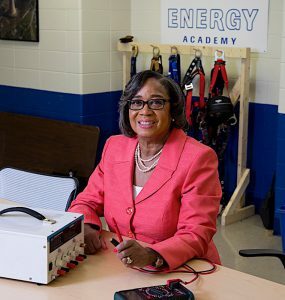 “INNOVATIVE WORK” Dr. Barbara Eason-Watkins, superintendent of Michigan City Area Schools, visits the NIPSCO Energy Academy classroom in the A.K. Smith Career Center in Michigan City. Eason-Watkins is leading a movement from traditional educational tools–textbooks, notepads and blackboards–to a digitized curriculum program–improving Wi-Fi service in schools, enhancing technical services, and deploying Chromebooks to students. This effort began at the high school and will eventually impact every school and every student. Dubbed the Technology/Digital Classroom Initiative, it began with a nearly $4 million program funded in part by the Michigan City Redevelopment Commission. Jon Groth was nominated for two innovations in his field. First, for leading the repurposing of a vacant, historic rail station to be used as classrooms, with much of the renovation work performed by students. And second, for leading the sustainable energy components to the repurposed and existing school buildings as part of the curriculum. 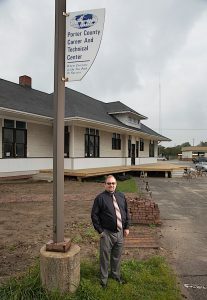 “A PASSION FOR SUCCESS” Jon Groth, area director/principal at Porter County Career and Technical Education, stands by the historic 1912 Grand Trunk rail depot that was moved onto the school campus and is being converted into a 21st century classroom. Groth, whose office has 35 teachers district-wide, including 12 within the central building, led the innovative repurposing of the 1912 Grand Trunk rail depot into a 21st century classroom. He worked with community leaders and volunteers to raise funds and relocate the historic building, with students helping to convert the 3,200-square-foot structure. Groth also launched the first student-built alternative energy demonstration project on a school roof in Indiana, including 15 solar panels and three wind generations that power the lights of the building. Thomas Keon has taught workable, viable and impactful strategies to countless companies and organizations. His own teachings were used in an innovative fashion to launch one of the first models in the country leading to the unification of two regional campuses, Purdue University Calumet and Purdue North Central, into a single university–Purdue University Northwest. Under Keon’s direction, this unification is the first of its kind in Indiana and one of only a handful of this nature in the country. It offers more choices for students, creates a regional identity for Northwest Indiana, and presents a greater cornerstone force to generate new economic activity in the Chicago market. Keon, a longtime educator, proved that those individuals who teach for a living can also apply their teachings as a practical solution to a challenging problem. “To know that a faculty member can actually apply a theory to a real world dilemma is wonderful,” Keon says. Once called the most polluted river in the world, the Grand Calumet River is “coming alive again,” according to judges (with thanks to the Grand Calumet River Restoration Project). By demonstrating an innovative collaboration involving eight companies working with regulatory agencies, the project transformed more than 80 percent of the iconic river in this region over the past decade. This massive cleanup stemmed from the 2004 Grand Cal Consent Decree, representing the second largest multi-party action of the Natural Resource Damage Assessment process in its history. “We are all so proud of this project and thrilled that we could be a part of bringing back a natural resource for which many, if not most people, had lost hope,” says Beth Admire, state natural resource co-trustee with the Indiana Department of Environmental Management. “This award is an amazing reflection on how an idea can become a journey that ends in great success. It gives all of us renewed energy to keep moving forward to perfect this resource and help others do the same in their communities. 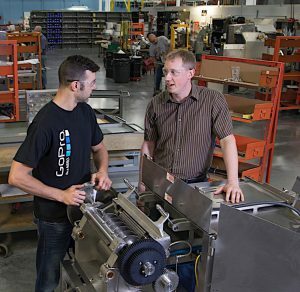 Built on a foundation of engineering marvels and innovations to produce industrial cutting machinery for 106 years, Urschel Laboratories Inc. has pioneered a transformation in technology while creating an entrepreneurial culture among its 400 employees. By doing so, it has become a global leader in food-cutting technology. ACCELERATING GREATNESS Rick Urschel, CEO of employee-owned Urschel Laboratories Inc., with machine assembler Jesse Nielsen. Now owned by employees, in addition to a new $100 million, 350,000-square-foot manufacturing facility and headquarters, this company is positioned to enhance its global leadership over the next century. This perfectly describes the Accelerating Greatness Award, which judges describe as an “accelerator” to inspire future innovation. “We hope our winning of this award encourages more companies to explore the employee stock ownership plan option,” Urschel says. Since 1910, Urschel has been designing and manufacturing precision industrial cutting machinery. From the invention of the Gooseberry Snipper to the development of the TransSlicer and DiversaCut series of machines, the focus has always been on finding innovative and efficient ways to improve customer productivity. “The desire to do great and innovative things should not be driven by recognition,” he says. This is a great piece– even though I may be a little bias. Thanks for spreading the news on innovations for this region and beyond..